We had 6 entries into the 2019 Cover Dog Contest and the winner has been chosen! Taffy, an adorable 9-year old miniature Dachshund, got her start in life in New York City. Her mother was surrendered to a shelter by her owner, a backyard breeder, when she became pregnant. To keep her comfortable, the shelter placed her with a foster family to care for her and her puppies when they were born. Even though Taffy had not entered this world yet, it was her lucky day! 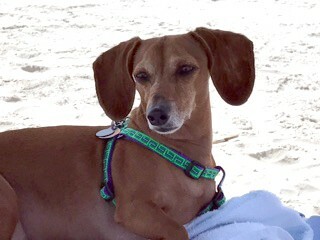 The foster mom had a good friend named Dorothy who loved Dachshunds and was heartbroken at the loss of her own 15 year old doxie. Knowing what a good dog mom she was, Dorothy was given pick of the litter, and it was Taffy who stole her heart! Dorothy said Taffy is the "sweetest dog ever" (an unbiased opinion, of course). We have to agree. Congratulations not only to Taffy, but to our other contestants as well. Each one is equally beautiful and deserving. Join us in fundraising so we can continue helping dogs like Taffy find their forever home through our adoption, foster and Adoption Ambassador programs. Be a part of the 2019 Walk for the Animals and raise $2,500 or more for the chance to have your dog as our 2020 Cover Dog. All contest participants must be registered online for the 2019 Humane Society of Broward County's Walk for the Animals prior to midnight, EST, on March 1, 2019. In addition to being registered, participants must have raised a minimum of $2,500 in verified donations to their online Personal Campaign page in order to be eligible. Attendance at the Walk for the Animals is not required. Participants reaching the $2,500 fundraising mark will submit a photo of their dog and a brief story as to why they believe their dog should be the 2020 Cover Dog. Each participant is limited to one entry per $2,500 raised. Unqualified registrants will be disqualified. One winner will be selected from those entered. Selection will be made by a random drawing of all entries. The winner will be announced on April 3, 2019 via an announcement to all 2019 Walk Participants.